Also called ambassador marketing, micro-influencer marketing, social media partnerships and collaborations… influencer marketing is HUGE for small businesses, and it keeps on growing. Influencer marketing works so well that 94% of businesses who use it say it’s effective, and it delivers 11 times higher return on investment than any other type of online marketing (source). While big cosmetics and beauty brands have been using influencer marketing to reach new customers, it’s no longer just reserved for the big guys. Salons and spas have started to experiment with “micro-influencers”, who can make a big impact on growing their brand and clientele online. But what exactly is “micro-influencer” marketing? Simply put, micro influencers are local Instagrammers or bloggers who promote your beauty business services to their followers in an authentic and engaging way, in exchange for a small payment or free services. In this blog post, I show you examples of salons that have made “brand ambassadors” work for them, plus a 7 step guide on how to do the same thing for your business. This is a salon marketing idea that works whether you’re a hairdresser, nail tech, esthetician, or spray tanner! Whatever your beauty niche, there are exciting influencer collaborations waiting for you! As social media starts to take over, people are spending more time online instead of watching TV, reading newspapers, magazines, etc. Because of this, businesses have been spending more time and money trying to make social media work for them. And there is nothing more powerful than “social proof” on social media. Social proof is when you aren’t the one selling your services: other people are doing it for you. 70% of millennials trust the advice of their Instagram friends over an advertisement or any other promotion (source). Seeing a post from an Instagrammer that you like and trust makes a much bigger impact than a post coming directly from a brand. Wouldn’t you love to be the salon that other people are promoting on Instagram? I believe that influencer marketing is the future of making money as a beauty business. Here are two examples of salons that have done it right. Salon influencer marketing done right: $1250 of bookings from a single blog post! Krystal Oickle is the owner of Origins of Beauty nail salon in Nova Scotia, Canada. In the early stages of her business she was looking for a cost-effective way to promote her nail services to women in her town. She had the creative idea of reaching out to a blogger and it paid off big time! 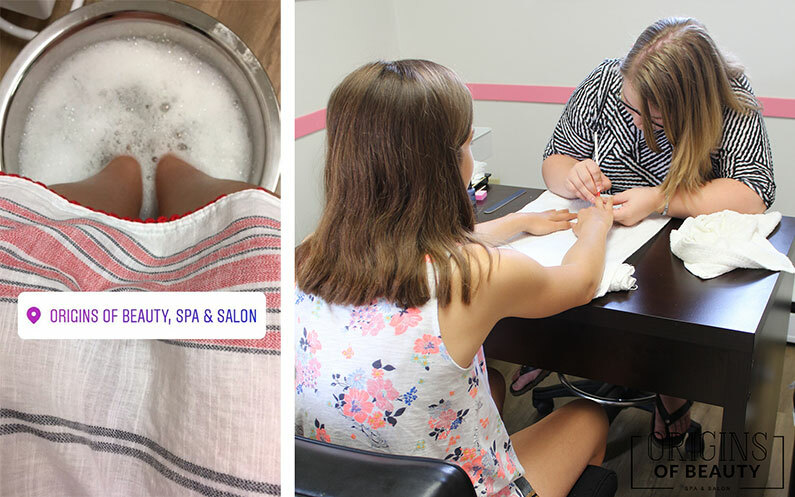 By exchanging a day of nail services for the blogger and her daughter, the blogger wrote up an article and review on her blog, took professional photos that Krystal can re-use in her marketing, and shared her experience on social media. But the best part? Krystal gained 25 new clients from this single promotion! With services that average $50, she made at least $1250 in bookings from a single promotional idea. Amazing! “Origins of Beauty provides high-quality manicures, pedicures, gel nail enhancements and many specialty services tailored to the needs of our clientele. Near the start of my business, since I didn’t have a huge budget for marketing, I decided to try out influencer marketing – to be honest it was a total random decision for me but one that paid off. “I set off to find influencer who was well-respected, well-rounded, and a key piece of my local community. Having a huge audience wasn’t such a priority for me. Fortunately I found Jennifer, a blogger in my town who checked off all the boxes. “I invited both Jennifer and her daughter into my salon for an afternoon of free services. In exchange, Jennifer would write a full blog post about her experience within my nail studio – this included the services she had done, photography and even an Instagram Story during her visit. “Immediately, Jennifer’s content had interaction from her audience on her blog and her social media accounts. It was the perfect opportunity for me to jump in, introduce myself, and answer questions, which lead to bookings. How this spray tanner turned a small marketing budget into promotional gold with her Instagram ambassadors! Ashlee Lane is the owner of Bronzed Babes with Ash sunless tanning in Queensland, Australia. Since many of her clients are into the gym and fitness, she decided to find two tan-bassadors on Instagram who are gym regulars. These partnerships have been a promotional goldmine for her: In return for discounted spray tans, Ashlee has gotten beautiful photos to use, 30+ new clients, and even two new friends! "I stumbled on the idea of influencer marketing by doing lots of research on different marketing tactics. “I wanted to target a clientele who loved the gym, so my two tanbassators are gym regulars. One owns her own business boot camp and the other is a gym lover. They both had a great following in the local area and great content so they were perfect. “I tan these two women for a largely discounted price and they give me great shoutouts, tags, send photos, and word-of-mouth shoutouts too. They also receive 10% off retail items at my home studio. “These woman have definitely brought me business. I have received a lot more followers since having these two ladies tag and post and at least 30 new clientele have seen my business via their feed/stories. I am very happy with the results! We have formed great friendships in the process of this also. Every so often we’ll have a photo shoot day where we catch up and create some great content. I couldn't ask for anything more." I hope you’re all excited and inspired to get started on influencer marketing for your own salon, after seeing how Krystal and Ashlee made it work! Here are the 7 steps you need to follow from start to finish to launch your very first campaign. Before rushing into any partnership and spending time and money, you need to plan it out! Planning it out means that you need to write down your true objectives, goals, and budget for working with influencers. It may seem obvious that your goal is to “get more followers and make more money”, but you need to be more specific. This means writing down something like: “I want to invest $200 in influencer marketing. My goal is to gain at least 50 new followers, to promote my new lash lift service to women 25 - 40 in my city, and to get at least 10 new clients for this service (value of $750)”. Keep the goal specific, measurable (include numbers! ), and realistic. It would be great to gain $5000 in bookings from a $50 influencer post, but that might not be realistic. In terms of budget, lots of people want to know what’s a good amount of money to spend on influencer marketing. I know it’s not fun to hear, but it all depends. It depends on the individual influencers, on your geographic area, and on how strong your business brand already is in your city. If you’re dealing with micro-influencers (with less than 30,000 followers), you can probably do sponsored posts for $50-$100, or in exchange for free services (source). If you’re curious about what other business are spending, 66% of them say they spend less than $250 per sponsored post (source). Keep in mind that many smaller influencers are also open to working with you for free products and services, so that makes this an inexpensive salon marketing idea, too. And so it begins! This is where the hunt for the perfect salon influencer comes in! First, you should keep a spreadsheet to keep track of people, and try to find 10-20 influencers in your city who could make a good fit. You can download my influencer tracker worksheet below! How can I tell who would be a good influencer? In general, you want to look for people who have a strong, genuine following, are in your target market, post high-quality content, and as a bonus have worked with businesses/brands in the past. This last point isn’t a must, but it’s helpful if one of you has previous experience. Working with someone who posts high-quality photos is so important, so keep an eye out for that when making your list. You want the photos to look pretty and give a polished look to your brand. Plus, if you can re-use those photos in the future it will be an amazing asset to have. First, search some of the top hashtags in your city (you can learn more about hashtags in this blog post). Check out some of the top posts for each local hashtag and see if they fit into your ideal influencer profile. Next, it’s worth checking to see if some of your existing clients have a strong Instagram following. If they’ve ever tagged you in their photos, check them out. You might be surprised! Also, try searching on Google. Try searching “your city name bloggers”, “your city name fashion bloggers”, or “your city name beauty bloggers”. You might get directed to their blog and from there you can check out their Instagram to see if they’re a good fit. In your spreadsheet write down the influencers’ name, a link to their profile, how many followers they have, how many comments and likes their average photo gets, what type of content they tend to post, and make note of any partnerships they’ve done in the past. Partnerships are often signalled with an #ad or #sponsored hashtag in the Instagram post. How can I make sure an Instagrammer’s followers are real? How can you tell that someone is ACTUALLY an influencer, and aren’t just buying likes and follows? It’s a really good question and important concern. The last thing you want is to spend hard-earned money on someone who won’t bring you results because their followers are fake. That’s why it’s important to click through to their followers and research some of them. But more importantly, read the comments on their photos! Comments like “Love this post!” “Amazing” and “Loving your feed” are probably fake, bot-generated comments. Comments that are relevant to the post and generate discussion are real. How many followers should my influencer have? This is totally up to you and often depends on how big your city is and who your target audience is. Even people with 2,000 followers but a ton of engagement and a loyal following can be better than someone with 400,000 followers but little influence. Apparently, partnerships with influencers that have less than 30,000 followers actually tend to get better engagement and results - probably because the influencer is a micro-influencer in a niche with a stronger hold (source). Once you’ve completed your influencer research, choose the top people you’d like to reach out to. Remember that not everyone will partner with you, so it’s better to have multiple options. You can contact them through their website, through a link in their profile, or through direct message on Instagram if they follow you. 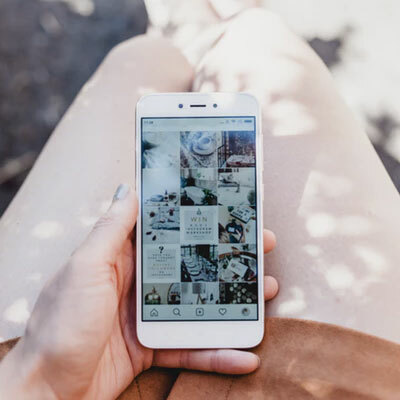 One thing to keep in mind: if you have a great-looking Instagram feed that’s got a strong following, it will help in getting the attention of influencers when they’re researching you. (You can read more about making a pretty Instagram feed here and here). It will also help to establish a connection before you reach out to them. If you follow them, comment on some of their posts, etc, a few days before reaching out you’ll be familiar to them already. In the first message, keep it simple. Don’t give details about payment or exactly how you want the relationship to work just yet. Send them a quick message to introduce yourself and your business, and tell them what you like about their feed/Instagram. Ask if they’ve ever worked with a brand or business before on an Instagram partnership, and tell them you’re interested in collaborating. At the end, ask them if they’d like to meet or have a quick phone call to talk more about it. Once you’ve set up a call or meeting with the influencer, it’s time to decide how you want to meeting to go! It’s good to have an overall idea of how you’d like the partnership to go in advance (if it’s too open and undecided, it will be difficult to come to an agreement), but then listen to them during the meeting and be flexible to their input. Do some research about different types of partnerships on Instagram - you can search the hashtags #ad or #sponsored on Instagram to get some ideas. What will you offer in return? Free services, discounted services, or payment? When and how will you provide the services or payment? How many photos or videos will they take? When will they post them? What will the caption or call to action be? Will you have the right to re-use the photos in the future for your marketing, social media and website? Once you’ve come to a clear agreement, make sure that you follow up with the influencer via email or messaging to re-state the agreement. That way you have it in black and white if there are any questions or disputes going forward (which shouldn’t happen, but just in case!). On the day of the promotion, you’ll want to make the collaborator feel like they have your support, but also maximize the effect of the posts with reposting and/or comments. Your campaign might consist of a blog post, an Instagram photo, and/or an Instagram story. Once the campaign is over, it’s essential to calculate the results that you’ve gotten. Otherwise, how can you really tell if the promotion was a success or not? How many new followers do you have? Can you trace them back to the campaign? Are there more than usual? How many likes and comments did the photos get? How many people have booked an appointment or claimed the promo offer? Track your return on investment - how much money did you get out of it vs spent? The results might take a little while to come in, so track them even a couple of weeks after the posts. Compare the results to the original goals you outlined in Step #1 to see whether overall you think the campaign went well. No campaign is perfect from the very start! Don’t feel bad if things don’t work out perfectly. The important thing is to figure out what worked well and what you want to do differently in the future. I find it helps to actually write down “lessons learned” so it feels like a productive, useful and educational experience, even if it wasn’t perfect. "There are so many pieces of advice I would share but the biggest is to FULLY understand your target market; the people you want coming into you for services. Once you know this, you need to tailor all your market to target those individuals including who you work with as influencers. For example, if is no benefit to you to partner with an influencer who’s audience is 10 – 20 year old girls when you want to target corporate women ages 35 to 45 who spent on average $300 in a salon every month." Salon influencer marketing is the next big wave in building your business online. Working with bloggers and Instagram influencers is no longer reserved for big brands anymore: Salons and spas and starting to figure out how to build their social following and their clientele by collaborating with local people who can help boost their brand. Coming up with a plan, researching the right people, and being clear about how the relationship will go is so important. It’s also crucial to measure your results and learn from the experience for your next influencer campaign. 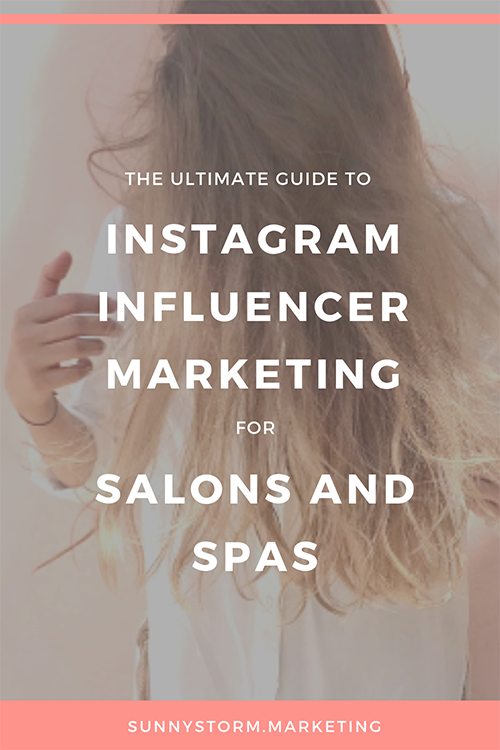 I hope this blog post has inspired you with a ton of new salon marketing ideas around Instagram influencers and bloggers!